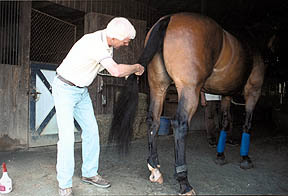 There are many theories when it comes to the proper way to care for a horses tail. One this is important no matter what breed your ride, no matter what discipline you pursue and that is gentleness. Tail hair is extremely fragile much like long human hair. Allow plenty of time if you plan to clean, comb or braid your horses tail. Never rush and most certainly never yank. To gently work loose knots or bit of dried mud you should start off by running your fingers through the tail. This can also be a good way to look for ticks which you should do daily for horses whether they are for polo or pasture. sizable portion can be pulled out with just a flick of the tail. If this happens or rough handling causes the hairs to break off then you are going to have to live with the mistakes for awhile. With only a few inches annually it can take a long time for a horse’s tail to grow. To comb or not to comb: Larry Jenkins has subscribed to both of the conflicting theories over the years. Combing is a hotly contested matter because of the long period for re-growth. Tail-grooming has two theories. One is to never touch it between shows while the other is to make sure it is combed every day. Depending on the products you use either method may appeal to you. If you use a product that makes the tail slick enough to comb smoothly then you will likely groom the horse’s tail each day. Products like this are good since they will also help anything slide off that would normally catch in the tail. You should always begin combing at the very bottom of the tail, pull the tail into sections and then gently work your way up the tail. You should only move up about two inches each time so that the entire tail can be properly combed. You may also decide to use a home remedy. Massaging with a little Listerine or baby oil is a good idea after washing the mane and tail with shampoo if you notice any flaking or if the horse seems to have an itch on their tail. Itching can also be relieved by apple cider vinegar and add shine at the same time. Using an oatmeal based shampoo is a good idea since it is soothing for irritated skin. You can even use these shampoos on the entire coat and not just the tail. A natural-looking trail is a must for both hunters and jumpers. The only time you really want to trim a horse’s tail is if they can step on it and even then you should trim judiciously. Make sure you have two people when trimming the tail. One person should place their arm just under the tail to hold it in a position similar to the way the horse carries it when walking which helps give you more natural end results. You don’t want a banged tail, one that is cut straight across like bangs, if you have a pleasure horse or a hunter. Although for dressage riders this look may be preferred. Before trimming a tail you should check with the trainer to find out what judges look for in your area. To smooth each hair you should move your hand down the tail and then stop just before reaching the ends. All the hairs will be about the same length by trimming only an inch or less. The tail will then have a fuller, thicker appearance. You should never trim too much at a time. You can’t but back what you have cut off, but you can always trim more if needed. To keep the mane even, many riders will pull it, but some may be uncomfortable with pulling a tail. This is probably good since overzealous pulling of the tail can diminish the way it looks for awhile. A tail can turn into a thin, ragged one quickly with pulling. Work your fingers through the tail to feel the column of squarish tail bones. Then part the hairs by running a comb down either side of the column. Leave the ones directly over the tail untouched and the ones on the other side can be thinned for neater more refined appearance. Take a small section of hair at a time that is only about half an inch. Hold onto the longer hair and tease the short hairs back. Then wrap the short hairs around the comb and pull in one quick, short motion. Never work on one area too long since you will run the risk of pulling too much. Move to another section after removing a few stragglers. You can always return to take out a few more hairs if you are not satisfied with the overall finished effect. Read the next horse care article on Bathing Your Horse.